Home Culture Fashion Ivy League John Simons Modernism Music Review Shoes Style UK John Simons - 'A Modernist' a film by Mark Baxter, Lee Cogswell and Jason Jules. It's safe to say that this piece of work is absolutely stunning. Bax, Lee and Jason have produced something that is not only a tribute to the great man but an education in itself for its viewers. John Simons is a British institution and someone who in my opinion has never been given the spotlight he so duly deserves. Without John many would not know style, they would not know more than what is in front of them on the high street. John has given so many people so much and 'A Modernist' takes you on the illustrious journey from 'Clothesville' to 'The Ivy Shop' to his current residency on Chiltern Street in 2018. 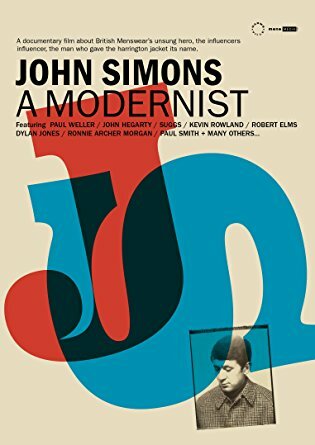 The title 'A Modernist' is absolutely perfect, John truly is a Modernist in every sense of the word, the only person I can compare him to would be Bowie and for me he personifies Modernism. Put it this way you won't see any fellas with daft haircuts and Union Jack jumpers cutting into his store anytime soon. John brought the American Ivy look to London and in general England! He kitted out the Suedeheads, Skins, Mods and the general menswear aficionados about town. With the release of this film people will definitely realise just how much he has done for British menswear and just how many lives he has affected over the years. With contributors such as Weller, Suggs, Kevin Rowland, Robert Elms and Paul Smith you just know you're among the proper sussed crowd here, no pretenders, no mod life crisis geezers wearing target tees, just proper fellas! The origin of the 'Harrington' jacket is touched upon and you are told how a leading actor 'Rodney Harrington' wore a Baracuta G9 in a film and from that day forward the short, smart jacket we know was coined the 'Harrington'. It's so much more than clothes and that's the real message here. Art, culture, music and working class heritage all bundle into one to give you a taster of a world that brings joy to everyone who enters it. Jazz, soul, culture and style are just some of the ingredients that make up this wonderful mans shop and world in general. John is a pioneer to British Menswear and this film makes that clear, giving him the recognition he deserves in full. Kevin Rowland states that there should be a statue dedicated to him and I completely agree on that one. John has given so many people so much and I don't think he realises just how positively he's affected all those lives! The blender that is Modernism has an integral mix of Ivy, Continental and of course British street style thrown into it. This documentary brings that to the fore and takes the viewer on a journey that sadly, many people will never go on.